Monday, June 13, Cocoabean gave birth to a beautiful bay black girl. We had suspected that Cocoa was planning to give birth when our backs were turned, and she proved us right. Less than half and hour after Mike walked by the pasture and into the store, a farm visitor came in the shop and mentioned the new baby. 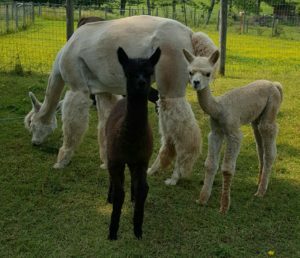 Mike, thinking she was referring to Hawkeye, told her he was a few weeks old, to which she replied, that the cria looked brand new. They went back outside to see our adorable Star Sapphire, sitting up and ready to face the world. 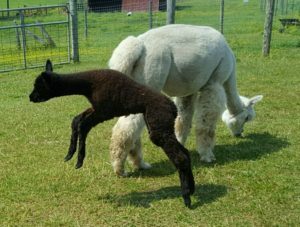 Star is a fun, active cria who got a great start in life. When the crias are 24-48 hours old, we do a blood test to check how well antibodies passed from the mother’s colostrum to the cria. Star’s results were excellent (greater than 2500 mg/dl), meaning she starts out with a strong immune system. She weighed 21.4 pounds at birth and is growing steadily. 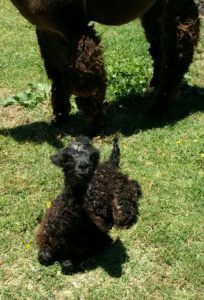 Hawkeye is happy to have a playmate, and the two crias are having fun running around together. You can see them both in the pasture by the store. Hope to see you soon.